The capital of the Barony of Caux is maintained at the Baronial Embassy to North America, at Toronto, Canada, but territories in Normandie and Shropshire, including the site of Castle Caus, are currently under claim. 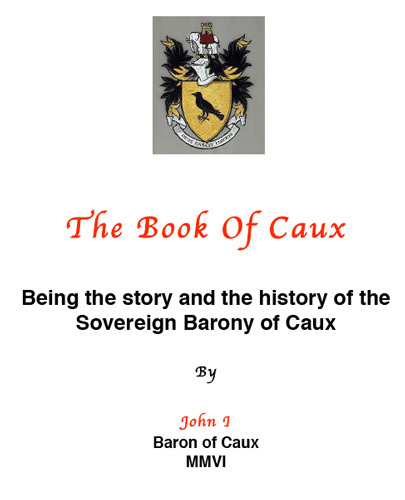 Restituted and declared a sovereign state on August 27, 2001, the Barony of Caux is under the leadership of His Lordship John I . Having a national anthem and its own currency, 102 Calestans (subjects), an army of 18, a police force of 2, and even the HLV Catherine Rose, the official naval vessel. 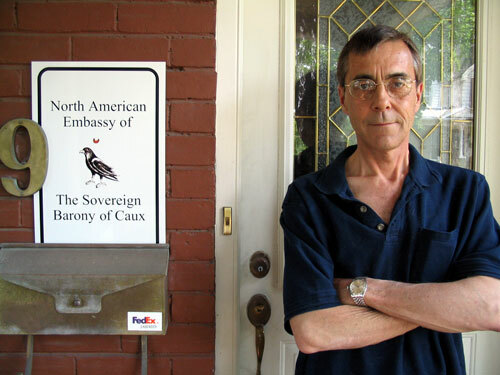 I had the pleasure of meeting His Sovereign Lordship John I, at the Embassy of the Barony of Caux in Toronto on May 30, 2007. An ancient and feudal Sovereign Barony of Caux. The charms of a garden nation and the friendly interest of the people will entrance you as they have so many visitors in the past millennium. The rolling fields of our bucolic Shropshire landscape, the dramatic chalk cliffs of our territories in the Pays de Caux, and the gentle attractions of the floral gardens at our Ambassaorial Enclave to North America. An ancient family in service to help control the borders of Wales, were independent and sovereign under the over lordship of the King. 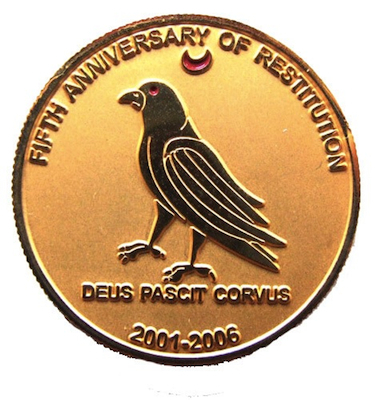 Traced back to Normandie and believed to be of Danish origin, The Corbets who’s name derives from the old Norman “Le Corbeau” which, over time, changed to “Le Corbet”, with the raven being their symbol. Historians, Pliny and Tacitus, wrote that there was a warrior family who took their family name and emblem from “The Raven”. They related that their direct ancestor was the Roman hero Marcus Valerius Corvus. It is said that Valerius had a Raven land on his helmet at a critical moment during a battle in Gaul and lead him to victory. The first documentation of this family is in A.D. 1040 when Le Carpentier mentions one Hugo le Corbetor as “Chivalier.” Until the Norman Invasion in 1066 they were an important family in the Pays de Caux region of Normandie. 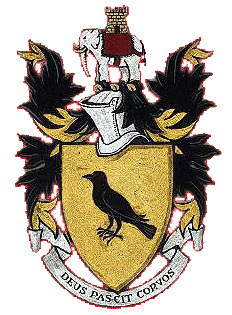 The Corbets owed fealty to the Earl Roger de Montgomery. They were in sovereign service to help control the borders of Wales, with absolute local authority over their demesnes. Independent and sovereign under the over lordship of the King, they were essentially free states. This sovereign status was reconfirmed on the Barony of Caux in 1165 CE by the Count of Anjou, Henry II, Pretender to the English Throne. The Barony passed to Beatrice Corbet in 1397, and the title was vacated in 1422. 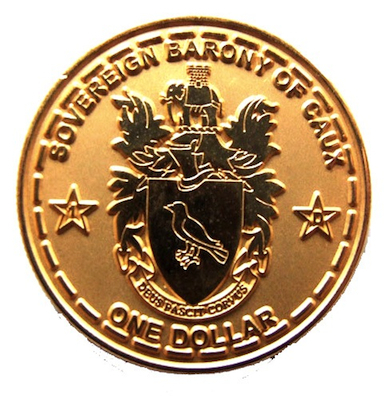 The present claim to the Barony dates from 1972, and the Barony was restituted on August 27, 2001. The Barony of Caux can be found in the Lonely Planet Micro Nations hand guide. An interesting read and one that anyone with a passion for travel should consider getting, providing you with a sense that world can really be yours. You may even want to create your own nation. Micronation: can be a country, with a group of people living in one area with their own government, language, traditions, a statement of claim to land and statehood, have a flag, a national anthem, currency, stamps, passports, visas and written constitutions. The first sentence of article 3 explicitly states that “The political existence of the state is independent of recognition by the other states.” This is known as the Declarative Theory of Statehood. Diplomatic recognition is a political act by which one state acknowledges an act or status of another state or government. A nation is only recognised as a nation if other nations that have been recoginised as nations recognise it. Want to learn more and interested in becoming a citizen of the Barony of Caux? Download your FREE copy of the Book of Caux (PDF). I am not sure if the Barony of Caux still exists, there appears to be a lack of activity as well the website is no longer active. I have no contact details for the Baron, however if you send an email using the contact I will try to assist you with the information I have. Send me an email using my contact form and I will send the information I have.